Introduction: Single incision laparoscopic cholecystectomy is a rapidly progressing field as it combines cosmetic and minimally invasive advantages. But it has also some disadvantages such as limitation of movement and clashing of the hand devices intraabdominally which makes the operation complex and unsafely. We herein describe a new access site for single incision laparoscopic cholecystectomy that can reduce these problems. Method: Fifty patients randomly assigned to two groups; New Technique and Standard Laparoscopic Cholecystectomy group, each for 25 patients. Acute cases and patients with history of previous abdominal surgery were excluded from the study. In new technique group, single incision is established in the right upper quadrant (right laterosuperior to the umbilicus) in order to place it on the same vertical line with the projection of the gallbladder on the abdominal wall to minimize the angle between the gallbladder and the hand devices to prevent to clash intraabdominally when used. Then three trocars are placed into the abdominal cavity. Once the laparoscope, grasper and dissector is in place, the overall procedures are similar to the standard laparoscopic cholecystectomy. 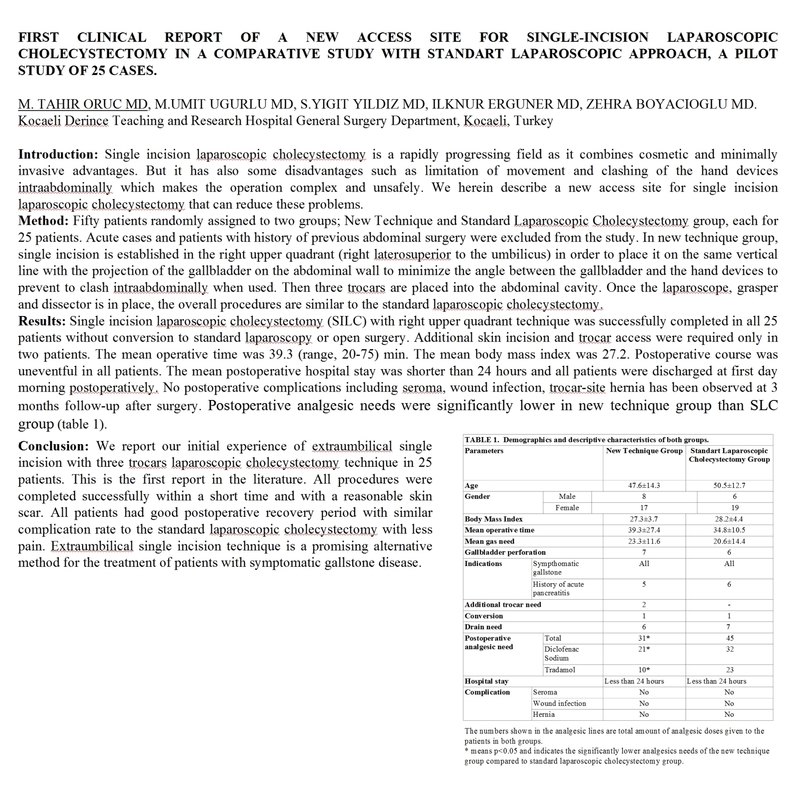 Results: Single incision laparoscopic cholecystectomy (SILC) with right upper quadrant technique was successfully completed in all 25 patients without conversion to standard laparoscopy or open surgery. Additional skin incision and trocar access were required only in two patients. The mean operative time was 39.3 (range, 20-75) min. The mean body mass index was 27.2. Postoperative course was uneventful in all patients. The mean postoperative hospital stay was shorter than 24 hours and all patients were discharged at first day morning postoperatively. No postoperative complications including seroma, wound infection, trocar-site hernia has been observed at 3 months follow-up after surgery. Postoperative analgesic needs were significantly lower in new technique group than SLC group. Conclusion: We report our initial experience of extraumbilical single incision with three trocars laparoscopic cholecystectomy technique in 25 patients. This is the first report in the literature. All procedures were completed successfully within a short time and with a reasonable skin scar. All patients had good postoperative recovery period with similar complication rate to the standard laparoscopic cholecystectomy with less pain. Extraumbilical single incision technique is a promising alternative method for the treatment of patients with symptomatic gallstone disease.